In a recent television interview with KHON2's Gina Mangieri, Hawaii Public Utilities Chair, Randy Iwase used a small car (HECO) going down the road as a metaphor to ascertain whether there is a need for a bigger car (NextEra). With all due respect to the Chair, the car metaphor does not convey how the utility of the future should be envisioned nor does the metaphor convey the function and value of a modernized electric grid. “Those in favor of the merger may say, how is it in the interest of the public if the merger fails and HECO can’t afford to do all the things it has to do alone by 2045?” Always Investigating [Gina Mangieri] posed to Iwase. “There was nothing in the hearing, for the record,” Iwase replied. “Two high officials in Hawaiian Electric, testifying at the hearing, said that they can move forward standing alone… even without NextEra. “What you have is Hawaiian Electric moving along in their car and along comes a big car saying, ‘We want to buy your car and you come along with us,'” Iwase added. “The question is, can that car still travel the road, the smaller car? And the answer they gave us was yes, it can. Yes, at one time HECO was the only the car on the road, a one way road built by HECO to shuttle electricity, starting where the HECO generator was located, delivered at the end of the road where the HECO customer used the electricity. Today, in the context of transforming and modernizing our electric system, it is more than just determining whether the small HECO car can handle when the future is not a linear pathway. Now, as electricity flows in two directions, customers can be either be generating or consuming electricity. Today, it is the road (my metaphor for the electric grid) that is more substantial than the HECO car. How that road gets maintained, developed and improved, how easily other cars carrying a variety of products and services are allow to merge onto multiple networks interconnected via a road system, how congestion points on the road system are addressed, how road safety is addressed, how reliable the delivery of these products and services by various vehicles are, how tolls to access the road are fairly assessed, how electricity is fairly price or how road taxes are apportioned by all users of the road and what about all those new navigation systems or the newer, faster car models that are whizzing by - are the challenges that get more complex as we try to develop a "clean, lean, ultra-reliable, customized, connected and communal" electric system. These are the challenges that the small car must navigate as the road it is responsible for transforms into a vast system of connected networks of electricity producers and consumers. Henry Ford may have mass produced the Model T, but it was the network of the interstate highway system that had a major impact to transform the landscape of the United States, its economy, connectivity and how people choose to live, work and play. Platforms are the dominating business model of the 21st century unlike the pipeline business model of the 20th century where the focus was on product, pushing it through a linear pipeline of mass production, mass marketing and, ultimately, a mass sale. The platform focus is on the interaction or connecting individual producers and consumers in a low friction, customized experience utilizing robust feedback loops and deep data pools, all this culminating in value creation. The platform features a shift from product to interaction, from the sale to the experience, from tightly defined roles like buyer and seller to constantly morphing participation migrating around an ecosystem like prosumers [someone that can generate as well as consume electricity]. From data largely locked in the pipeline to data distributed out through the ecosystem. From a linear process to a multi-dimensional activity. And all this is constructed on the building blocks of infrastructure, data and transactions.
. . . the electric grid is being redesigned through digital and other technological breakthroughs has the capacity to become one of the most impactful platform architecture of the millennium, facilitating the migration of power across the grid in an efficient manner, inviting a multitude of actors, buyers and sellers of energy services and information to interact on the grid as the ecosystem generates all the benefits networks have to offer. Enhancing choice by incorporation of multiple energy options and clean forms of energy, to energy use structured and priced by time of day to options to use no energy at all. Generating efficiency by incenti[viz]ing energy flows or disincenti[viz]ing energy usage at the right time at the right place at the right price. Creating opportunities by facilitating the creation of a 21st century marketplace of the people. It is unfortunate that those that buy into parochial politics cannot escape linear thinking and keep falling back into mantra-like soundbites like "100% renewables" or "no-fossil fuels" or even "local values" without paying attention to the reality of the situation and the cost and effort of what it will take to attain such a 100% renewable future or what it means to put one's values into practice. One's vision must align with the practical realities of how to achieve and its much more than determining small car or big car. And, sadly, it is patently unfair to think the small car would denigrate and undervalue its own worth publicly - the public, those with self-interest, some politicians and the regulator has done that for them. Regulatory upgrades happen slowly within an electric community. Poo to those leaders running monopolies who put road blocks that limit our chances to restructure our energy options into a modern society where energy has no real owner, taxing the users with high fuel costs with large plants who's life time use become decades of old equipment with thermal dynamic inefficiencies of 24 percent. We can not live with these old ways that limiting the poor who can not pay the bills. Today governments & customers who want to contribute to their own pollution free power will add the necessary equipment to their buildings allowing them to produce their own power or energy needs whether they use PV, Wind, Storage, or MiniCHP or combination of options. This infrastructure will be paid for by the savings from a conventional energy supplier who's inefficiencies are lower for a list of reasons. These new producers will install behind the meter and engineer the systems to produce just enough for their use, eliminating the complication of sharing their extra energy with the grid. 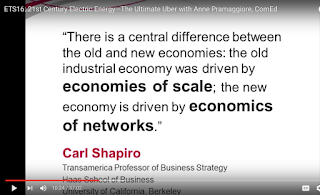 The second phase or development may happen when the utilities fairly price the energy that could be produced by the individual customer producers,or when the grid will become electronically sufficient to allow energy to flow multi-directional. 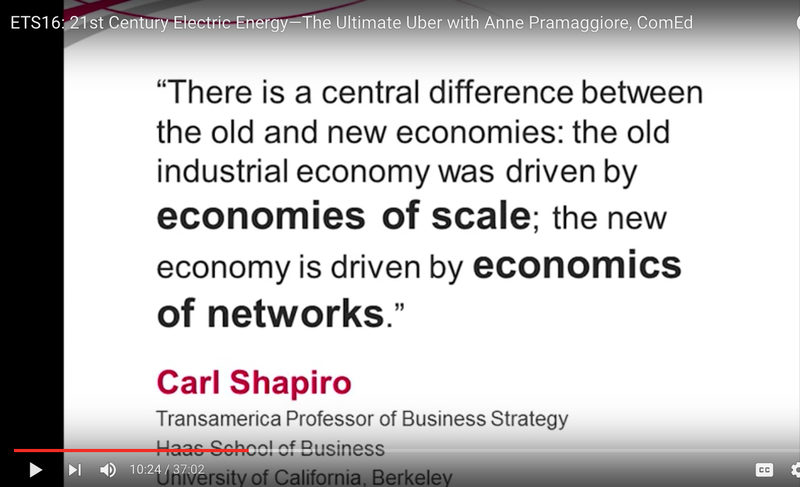 Then energy production will be ramped up by the consumer producers to the next level and shared with the network/grid. With today's new electronics and descending cost of the production equipment, the first phase can and is beginning to happen. A miniCHP producing 5KW of power and waste heat for a home or a string of CHPS for a hotel, can be programmed to go on and off to cycle with a PV array or the needs of the building hot water requirements without any intervention from the power company or the owner. The needs of a 20th century monopoly energy sweat shop belching CO2 are no longer required. The new network has emerged, and will continue to emerge, dropping the high cost of energy to society.